Nothing seems to be slowing down Elizabeth Banks' career! After the jump, more about Liz shooting a film in Philly, her appearance on last night's "30 Rock" and her upcoming directing gig! While this wasn't created by a Penn alum, I wanted to share this new Oscar winning "Logorama" film because it just came online and it is really super creative and super funny. In the film where Los Angeles is made up entirely of corporate logos, Michelin Man cops pursue a criminal Ronald McDonald. This really is brilliant! It's no wonder why it won an Oscar! Enjoy the film after the jump! Last weekend Mask and Wig came out to LA to perform its 122nd Annual Production "A Cheshire Catastrophe". And in case you missed it, DT has some exclusive highlight clips for you. ...And then, after the jump, check out my thoughts and some select moments from the night which include the show's opener, tap number, kickline and post-show floorshow! 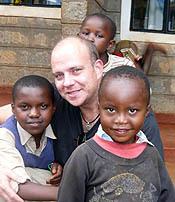 Hollywood Exec's New Mission: "Kenya Spare a Camera"
What happens when one Hollywood Exec has a spiritual awakening and decides to make a life change? 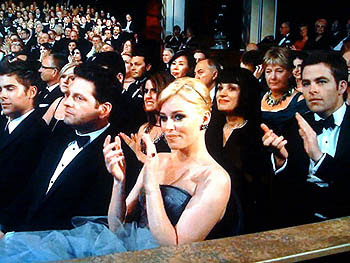 Did you see Elizabeth Banks (C'96) present on last night's Oscars? Liz looked beautiful as she presented for the Sci-Tech awards (she hosted 2 weeks ago). After the jump, watch Liz talk about "super nano cubic grain technology" and take a jab at James Cameron. She's surely in her element!